Because we had left things to the last minute in deciding whether to go to Edinburgh or Glasgow, we didn’t have any accommodation organised in advance. After spending an evening of running various web searches, I ended up just booking into the same place I stayed when I was in Edinburgh in 2006. Though it now has the bonus of free wifi. Because it is very conveniently located for Holyrood Palace, that was the first place we set off for (Michael had never seen it, and when I went some of the rooms were closed). However, we had failed to make the connection that because the Queen had been visiting Culloden, she was obviously in the North, and would therefore be in residence. As it turned out, she had left the Palace that morning, but it was still closed to visitors for a couple of days. 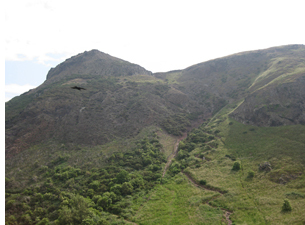 So we went to Holyrood Park instead. In the end, we didn’t go all the way up Arthur’s Seat, but we still got some great views of the park, Holyrood Palace and the city. We then walked up the Royal Mile and spent an enjoyable few hours in the Castle. There were still quite a few hours of daylight remaining as we left, but at that point the mild headache I’d had all day turned into a migraine, and I didn’t really feel up to hiking around the city any longer, particularly since it was actually quite hot. So we called it a day. The next day, the weather actually turned Scottish – or at least, more so than we had experienced thus far: it drizzled on and off for much of the day. 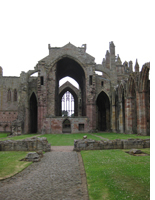 However, it didn’t stop us from seeing three of the Border Abbeys included in our Historic Scotland passes: Melrose, Dryburgh and Jedburgh. It wasn’t actually raining when we were at Melrose Abbey (founded in 1136 by Cistercian monks) so we spent quite a while wandering around, climbing the tower, and listening to the free audio commentary. 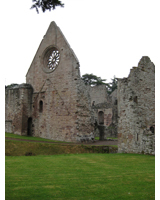 When we got to Dryburgh Abbey (1150, Premonstratensian canons) the drizzle had definitely set in, so we didn’t spend as much time there as we might have. (Also, they didn’t have a free audio guide.) Sir Walter Scott and Field Marshal Haig are both buried here – Scott has the more impressive memorial, although there were a lot of regimental wreaths at Haig’s grave – I believe there had been some sort of Services Day, or something, recently. 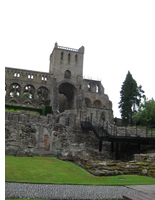 Finally, we went to Jedburgh Abbey (1138, Augustinians). Situated high on a hill, it was perhaps the most impressive of the three, although since the Nave was undergoing conservation work, there was a certain amount of unsightly scaffolding (and some points in the audio tour where we couldn’t quite follow the instructions on where to walk). After Jedburgh, we crossed the border into England, and went to the farm B&B near Hadrian’s Wall that we had booked into. In our time in Scotland we had only had one brief glimpse of a Highland cow – so of course, now that we were in England, the farm had two of them in the field we could see from our window. They also had a very friendly cat.